Left handedness in children - Show Me WOW! Left-handedness is absolutely normal in many children and they should be allowed to be left handed if that is how they are most comfortable! Left-handed children prefer to draw and write with their left hand. Their left hand is their dominant hand and they are more comfortable and more proficient when using this left hand than when using their right hand. Left-handedness is as normal as being left footed, when they have a dominant left foot and so prefer to kick with this one. Similarly they could be left-eyed, when, if given a tube of paper to look through, they will automatically choose to put it to their dominant left eye. Some classes might have no left-handed children and other classes might have a group of left-handed children. What amazes me is that in many cases, the teachers have not noticed the degree of left handedness and have not accommodated for it in their classroom management. Teacher awareness and teacher compensation strategies can make such a difference to the educational development of the left-handed child. How can we initiate compensatory measures for children who are left handed? 1) Make sure that the child feels no stigma about his left-handedness. It is normal! 2) If the children sit in pairs, make sure the left arm of the left-handed child is not being knocked by the right arm of the right-handed child. Have the dominant arm in the gangway so the left handed child has freer movement. His written work will be better this way. 3) Recognise that our writing is orientated for the right handed child. 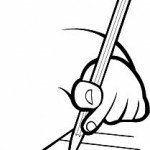 The right-handed child can see his writing as he writes it! 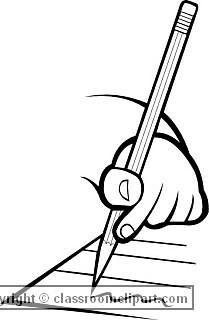 The left-handed child cannot see his writing as he writes, as his hand covers it up. He will compensate by hooking his hand and holding his pencil awkwardly, or he will just write without trying to see his work and smudge everything as he goes, probably wondering why this is happening to his writing and not to everyone elses! 4) Offer him a cushion! Once, desperate parents appealed to me to help with their teenage son’s poor handwriting. 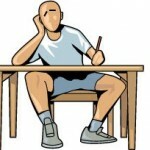 “How will he pass examinations if the examiners can’t read his writing? 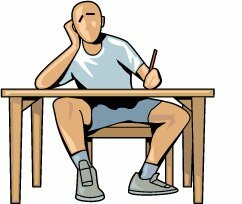 He writes best for less strict teachers!” At first I thought his handwriting was adversely effected by stress…he was more at ease with the less strict teachers, but when I realised he was left-handed I knew he needed a cushion to sit on to see his writing! The less strict teachers let him sit with his leg tucked under his bottom. The strict teachers made him sit up straight. 5) Be aware that some activities are really difficult for the left-handed child trying to manage in a right-handed world. Scissors are made mainly with their cutting edges orientated for right- handedness. Some stationers produce left handed scissors, but they are rarely available in schools. From scissors, imagine sewing, knives and forks, ruling a line. All sorts of activities may cause difficulties for the left-handed child, not because he is clumsy, but because he has the difficult choice of re orientating instructions he is given, or of attempting to use his less dominant right hand. Either way, his coping efforts need to be sensitively responded to by the teacher. 6) Find a left handed adult and chat about the difficulties he or she found as a child.